This has been circulating on the net for awhile, but certainly deserves mention on Fast Food News. It is the story of what is certainly the largest In-N-Out burger ever created. 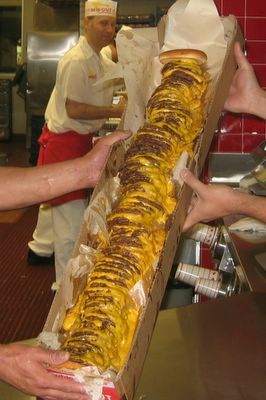 The 100 x 100 is a single set of buns with 100 meat patties and 100 slices of cheese in between. The additional photos and narrative are worth reading. I think I'll post this photo on my fridge. I'd get nauseated before I could even open the door. That's some burger. No In-n-Outs here, I'm afraid, but we do have Fatburger at least. The Atkins Diet was launched in the 70's when Dr. Atkins published theNew Diet Revolution. Atkins diet spoke up against the medical establishment and told us of the effects of sugar and carbs in foods, and how managing your intake of carbs would lead to weight loss. The two week induction phase of the Atkins Diet, is the strictest phase of the diet, where only pure proteins are allowed, and a very limited amount of carbs. The proteins allowed include meat, fish, poultry, and eggs, an pure fats such as olive oil, butter, and mayonnaise. Yeah but as long as you don't eat the bun the 100x 100 is fair game . . .
dude. so not the biggest burger..
101X101. in n out in San Pedro.